You can flip or pitch baits into heavy-cover with your high-speed reel, but can you get fish out? The Abu Garcia REVO Winch Baitcast Reel is built for pulling 8-pound largemouth out of a glob of milfoil. 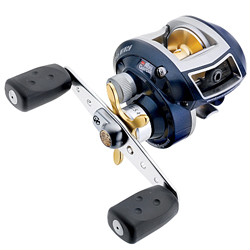 Engineered with a powerful 5.4:1 gear ratio, the REVO Winch is perfect baitcast reel for slower presentations with larger crankbaits, or for flipping and pitching plastics and jigs in heavy-cover. Power, durability and dependability are what the REVO Winch is all about. Its Duragear oversized main gear delivers serious winching power, while the REVO Winch's hitch-free Carbon Matrix Drag is ultra-smooth. The REVO Winch Baitcaster's power is housed in the lightweight X-Craftic alloy frame and side plate for maximum durability and corrosion-resistance. 10 stainless steel HPCR ball bearings + one roller bearing provide additional protection from corrosion. "This reel has by far exceeded my expectations. I was out fishing earlier today, and I had on a 3/8 ounce crankbait and I was consistently casting about 60 yards. On top of that, this reel is so smooth. I will never buy any more "cheap" baitcasters. REVOs are the best low profile baitcaster. Period." "i think garcia came out with the best reel ever so far i own 3revo's the revo s,revo stx,and revo wnch ,going to buy another wnch this week i thought the first one was smooth till the wnch came out it's tough on the big reds and trout. i highly recommend." "ABSOLUTELY PERFECT! Even 10lb + bass buried in a forest of weeds are no match for this baby!" "This Revo is the bomb for throwing deep diving cranks a long way. Abu did it right with the deep, high capacity spool. It will launch a Norman DD22 a great distance. In addition, the reel is exceptionally well made. I highly recommend it."